A few weeks ago, Alyson over at The Average Girl's Guide posted a tip, to challenge yourself to pick out three items in your wardrobe to wear throughout the week, see her post here. 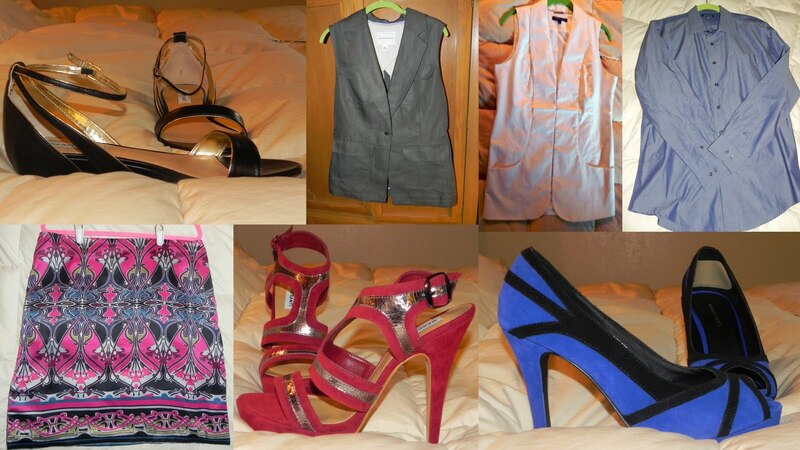 So I (being the wicked overachiever that I am) picked seven pieces that I will be wearing. 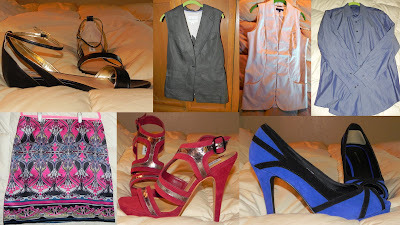 I chose these items because they are things I've bought but haven't really worn; the skirt and men's shirt still have their tags on, and the shoes are all brand new! I don't believe I've worn either vest, too! I'll post outfit pics showing what I've put together every day! Do you have any suggestions of what I should pair the items with?? Love these pieces. Can't wait to see what you put together! Yayyyy! You are quite the overachiever taking my now measly three item tip and making it into SEVEN! Would love to see the button down long sleeve with the silky looking skirt. Pretty! Thanks so much for mentioning me/my blog. Makes me SOOO happy to see someone taking me up on the tip! Those cobalt blue and black shoes are GORGEOUS! How about the skirt with the vest? I SOOO need to do this with my closet too. You shouldn't have trouble wearing any of these pieces, they are all great! Can't wait to see the rest of what you put together.